We're told repeatedly that the future of music is in downloads, and a primary source of downloaded music for a significant proportion of the planet's music-consuming population is, of course, Apple's iTunes. On 12 July 2011, Apple released the first 'Mastered for iTunes' title, and 'MFiT' (as it has become known) as well as its associated 'iTunes Plus' format has been heralded as a great new high-resolution download medium. There is, of course, a great deal of hyperbole written about this new 'format' in the consumer press, but the bottom line is that it really does represent a useful improvement in audio quality compared with the former default iTunes 128kb/s AAC format. I'm not sure how any lossy-codec can truly be described as 'high resolution', but these things are all relative, I suppose! MFiT's improvements are partly attributed to the audio encoding process, as the result of incremental advances in the underlying AAC codec technology — hence the 'iTunes Plus' name. For example, a variable bit-rate is now used to provide bursts of extra data capacity to accommodate particularly complex sections, and the encoder technology itself has evolved to deliver better results. This last point is true of most lossy codec designs, in fact; the decoder technology is defined in the format standard, but the encoder can do more or less what it likes as long as it produces a file that the decoder can decode! Consequently, most lossy codecs have improved in quality over their lifetime as the designers' knowledge and experience builds. Even more significantly, the MFiT AAC codec can now accept 24-bit source files at either standard or double sample rates — hence the 'high resolution' moniker. For me, the biggest step forward is that MFiT contributors are encouraged, at last, to check for encoder clipping — a task which is aided considerably by Apple's provision of a set of free software tools. The complex sub-band filtering that all lossy codecs employ to assess spectral masking prior to discarding 'irrelevant' audio information is very susceptible to 'intersample peaks' which are extremely common in hyper-compressed music. The result is that encoding peak-normalised audio files or CDs to the AAC format (or MP3 for that matter) often clips and sounds pretty nasty. These free software tools (sadly, Mac-only at the moment), enable the audio creator to format, test and assess how the audio will be affected by iTune's AAC encoder, including revealing clipping issues, so that they can then make the appropriate adjustments and compensations before submitting the high-res linear audio files to iTunes for them to perform the actual download encoding. 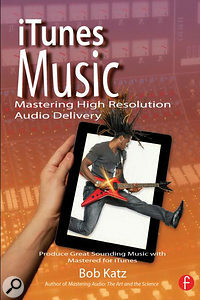 And that, in essence is what Bob Katz' new book, iTunes Music (ISBN 978-0-415-65685-6, Focal Press) is all about. In the space of 135 pages, divided into seven logical chapters, Bob discusses typical workflows and explains how and why to use the MFiT software tools to optimise audio files ready for submission to the Mastered For iTunes program. Along the way, he explains myriad aspects of the technology, science and best-practice techniques associated with creating, mastering and optimising MFiT files — including some excellent chapters about loudness and loudness normalisation, and why the latter is set to vanquish peak normalisation, end the loudness war, and become the saviour of natural, dynamic music. Hurrah!